Zuma meets Charlie breeding. Pups due Feb. 26, 2018. This chocolate litter of pointing labs is one exceptional combination! 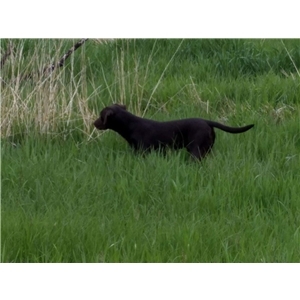 These pups are bred for the classic Labrador looks, drive, determination, strong retrieving and pointing, upland and water marking, and the true all around family companion. Zuma's pedigree includes dogs that have earned titles on many different venues. In fact, his mother is the only living dog with Master titles in all four, AKC, APLA, HRCH, and NAHRA. Charlie's pedigree is unique as well and adds APLA and Field Testing titles. Some notables in this pedigree are 4XGMPR Grass Lake Greeley MH, 4x GMPR MHR Baier's Lady Legacy MH, GMPR Northstars Lonesome Dove, 4xGMPR HRCH Cams Prince Charming Duke, APR Northstars Feelin Tips HR, 1.5xGMPR HRCH Tiger of Cattail Corky, and 4XGMPR Rik's Risky Raider MH to name a few. 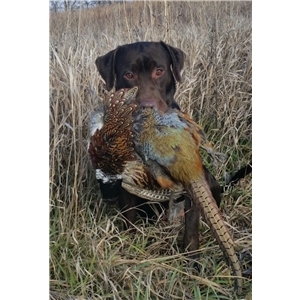 Zuma is a 2XGrand Master Pointing Retriever and is on his way to 4XGMPR and MH with the AKC. He is very muscular, lean, and has a nice broad chest and square head. He weighs in at 72 pounds and has a ton of drive and is simple crazy about birds. Zuma is a brush buster in the upland field and covers a ton of ground. He will go hard all day long and will go from quartering hard to stopping on a dime to point a bird. He has one of the strongest, most intense points you will find in a pointing lab. He simply loves the upland field! He is fun to watch and does his upland and water work with much drive and excitement. Zuma is a good marker and has an incredible nose. He naturally took straight lines on water work and is super intelligent. Zuma is a hard hunting bird crazy machine who turns it off and goes into the house at night. Charlie is super intelligent and has always had a strong focus and sense to please, which made her very easy to train. Charlie is an APLA Ceritified Pointing Retriever. She has a great nose and locates and points birds up to 20 yards off at times. Charlie is very muscular and lean and has a beautiful head and chest. She always gets compliments on her looks whenever we are out and about. Charlie loves the water and has plenty of focus to sit in a blind, mark any bird fall, and yearns to retrieve in water or upland. She quarters nice and works close and is one of those dogs you don't need to put a collar on, but just naturally stays close in the upland field. Charlie has plenty of drive and can go all day, but can also come home and shut it off. Pups come with all the health clearances, shots, and 28 month hip and eye guarantee. Ready to go end of April.